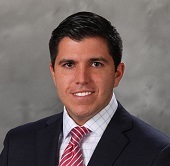 Adrian J. Alvarez is a member of the Firm’s litigation department. His practice focuses on business and employment litigation, with emphasis on commercial real estate and corporate governance. Mr. Alvarez’s trial practice is diverse and often involves complex commercial matters. His experience includes the successful representation of municipalities/governmental entities, housing authorities and numerous private sector clients in the defense and prosecution of civil claims in both Federal and State court throughout the State of Florida. In addition, he has significant experience in Arbitration involving construction clients and various business entities. Moreover, he regularly represents corporate clients before administrative agencies, including the Equal Employment Opportunity Commission and the Department of Labor. His professional activities include membership of the Palm Beach County Bar Association, Palm Beach County Hispanic Bar Association, South Palm Beach County Bar Association, Broward County Bar Association, and Broward County Hispanic Bar Association. He was also named as a Rising Star by Super Lawyers for four consecutive years.